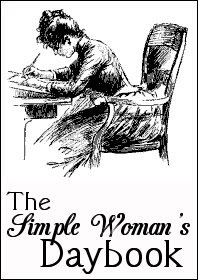 Visit Peggy's blog, The Simple Woman's Daybook, for more great daybook posts or to join in yourself! Outside my window~ the grass needs cut, but hubby is a busy man right now. If I wasn't allergic, I would gladly do it for him. My unknown tree in the middle of the front yard is blooming now, and it's just beautiful. One day I hope to find out what kind of tree it is! I am thinking~ about how in the world I'm going to lose this weight when my back won't allow me to exercise. I'm just going to have to be really, really careful about what I eat, and walk every chance I get! I am thankful for~God's patience with me. If He had my patience, He would of given up on me decades ago. I feel like I have learned so much, but know that I've only barely begun to tap into the knowledge and Wisdom He has to offer me. I have an entire lifetime of learning to go still! I'm also thankful for the wonderful Authors He has placed out there, and the wisdom He has given to them to share with me and others. I have grown so much through their books, with the Holy Spirits help. I'm oh so thankful! I am wearing~a light pink tank top and black capri sweatpants. After I finish this, and read my bible, I will get dressed for the day. I am going~to possibly have to make a trip to Walmart. I don't like going there, and I try to wait until church days, so I don't waste gas and can do it all in one trip, but that may not work this time. I am currently reading~Created to be His Helpmeet by Debi Pearl. I think this is the BEST book I have ever read. To be honest, I don't want to be finished with it. That's why I am pacing myself. It has helped me beyond words, and I want to still read more every day. In fact, I may come back and reread it a little bit at a time for years, just to keep it fresh in my mind. I have found my life's purpose in this book! I am hoping~to go to Kansas and Colorado in August. We are really praying, and really trying to go. How wonderful it would be to see both our families in one big trip! Mike's mom is not well AT ALL and he is going to go see her whether we can all go or not. I'm really hoping it will be all of us! On my side of the family, this may be the last time that the whole extended family can be there together. They are having an 80th birthday party for my Grandma and they want all the kids, grandkids and great-grandkids to be there. I pray the Lord would allow us to be there. Some of you remember that they tried to do it at Christmas, and I was the only one not there... it broke my heart. On my mind~ My 6 year old son has not been helped by his recent trip to the allergy specialist. He changed his meds, and it did him no good at all. He still coughs all day long and his eyes were so irritated that he got allergy conjunctivitis in both his eyes. Thankfully it went away in just a couple days without medicine, but still. My heart aches for him. I can't stand not being able to make him better. I am praying that the Lord would show us what to do. A different specialist, or wisdom for his current one, to do and find the right help for my dear, sweet son. Noticing that~it takes me a LONG TIME to do this post every week. I hope I can keep it up. From the learning rooms~3 weeks to go! It's not that I want to be done, I'm just excited for next years curriculum! I'm sure that when they're all older, I'll be happy and exceedingly ready for summer break. But as for now, I love teaching and don't want a break! Plus, my boys get in trouble when they don't have something constructive to do! Good thing I have reading planned for the summer! From the kitchen~Nothing exciting. Our budget is so tight as we try to save for the trip, I'm not really getting creative in the kitchen. Simple filling meals, is what we're after! Around the house~Lots to do. I have to finish my list from yesterday. I had several interruptions in the day yesterday, and I just sat and enjoyed hubby last night. So, I'll be working on that list today! The kids are currently cleaning the dining and living room. Well, except Miss. Piggy. I hear her in the bathroom, probably soaking her hair in the sink! My mother did these. One is an actual oil painting, and one is a framed print of a section of an oil painting she did. It's titled "Lean On Me." My Grandma has the original painting, and one day it will be passed down to me. The girl in the first painting is me! My mother painted this after I was saved. It's me walking from the darkness, into the light. What a joy it is for me to look at this painting. I know my mother poured her whole heart and soul into it. I hope for it to be passed down to one of my daughters some day! Anyway, I had to show you where my artistic talent came from! What beautiful pictures and what a great legacy to pass down to one of your girls! Thanks for visiting my blog ... I hope you'll come again! Allergies can be pretty tough because everyone responds to treatments differently. Unfortunately your son may have to try several medications before the right one is found. I pray the Lord will show you what is best for him. The paintings are gorgeous! What a blessing to be able to use them to decorate your home and share with your family. What a great, uplifting entry and of course, I stand amazed at any mother of 4 and how they do all they do. Sure am hoping that the Lord will make a way for you to go to Kansas and Colorado. Blessings to you!